NEXCOM cyber-vision system CVS-135 is an open platform for versatile video and media applications. Featuring the 7th generation of Intel® Core™ processors paired with an integrated GPU, the CVS-135 embodies a complete solution to capture HD and UHD videos, process great quantities of data, and transmit for real time usage. Offering automatic compatibility between devices, high performance, and maximum flexibility for development and deployment, the CVS-135 is the right platform to simplify video, imaging, and media applications. 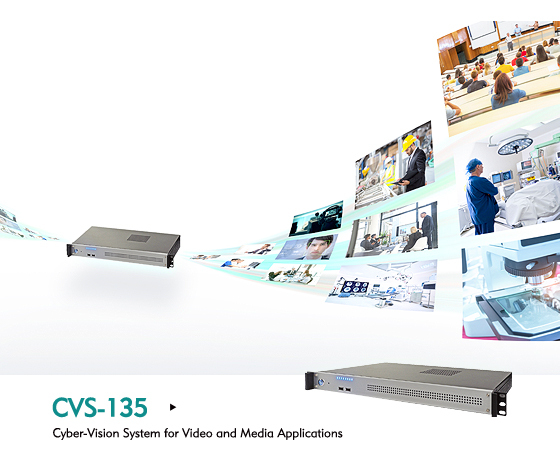 The CVS-135 gathers all videos into one platform offering a wide range of input options and unparalleled compatibility. The plug-and-go technology supports simultaneously up to 6 video channels of 1080p at 60fps from digital and analog configurations such as SDI, HDMI, VGA, DVI, YPbPr, S-Video and Composite, automatically adapting parameters like definition, resolution, color, aspect ratio, and frame rate to seamlessly detect, capture, and process videos. Equipped with a high performance GPU, the cyber-vision system is able to handle massive amounts of data accelerating video handling, fostering deep learning, and fulfilling AI application needs. Tailored as an open architecture platform, the CVS-135 brings exceptional flexibility with full access to a comprehensive SDK in order to easily target different imaging applications. The SDK supports a full range of video manipulations, analysis, and distribution functions, with source codes and samples for various scenarios to facilitate development. Furthermore, interfaces to computer vision frameworks like OpenCV and OpenVX enable pre-verified functions and objects to smooth deployment for solution providers. The cyber-vision system can be easily applied to environments requiring video inspection, lecture capture, and medical imaging. In factories, automatic inspection ensures consistency in quality control of all types of media players eradicating human errors, increasing productivity while recording progress to address recurrent defects. In education, it breaks the time and space limitations providing bi-directional video and audio content in real time to enrich the learning and teaching experiences. In the medical arena, the CVS-135 bridges different equipment like X-Ray, CT, MRI, ultrasound and endoscope, with healthcare subsystems by acquiring and exchanging critical data and images, solving compatibility issues among dissimilar providers. The cyber-vision system CVS-135 is designed not only to provide remote trouble-shooting but also diagnosis at a quick glance. Embedded LED indicators in the front panel allow non-technicians to observe video signal and operating status to ensure smooth processes, optimal network, and disk space availability. In the need of trouble-shooting, technicians or IT administrators can assist, manage, and control remotely through Ethernet or Wi-Fi connections.